At this Brookdale Research Field, MBFI is researching the management of riparian areas in wetlands. This page provides information about this particular research project; including the background, objectives, and updates. 2016 Diagram of assessments on the Brookdale site. Red indicates unhealthy; yellow indicates functioning with problems; green indicates healthy. Riparian areas are the part of the landscape directly adjacent to streams, lakes and wetlands that gradually grades from wet to dry. The vegetation and soils in these areas are strongly influenced by water and are very productive. Wetlands in agricultural fields pose challenges for producers. However, they still provide many important ecosystem services such as sediment trapping, nutrient and pesticide filtering, shoreline stabilization, water storage, aquifer recharge, carbon storage, and habitat for wildlife. Keeping wetlands intact also provides salinity control. The riparian health assessment process incorporates data from a wide range of biological and physical categories. The basic unit an assessment is referred to as a polygon and can be based on vegetation differences, geologic features, land management or other observable characteristics. A survey with a rating scale is then used. 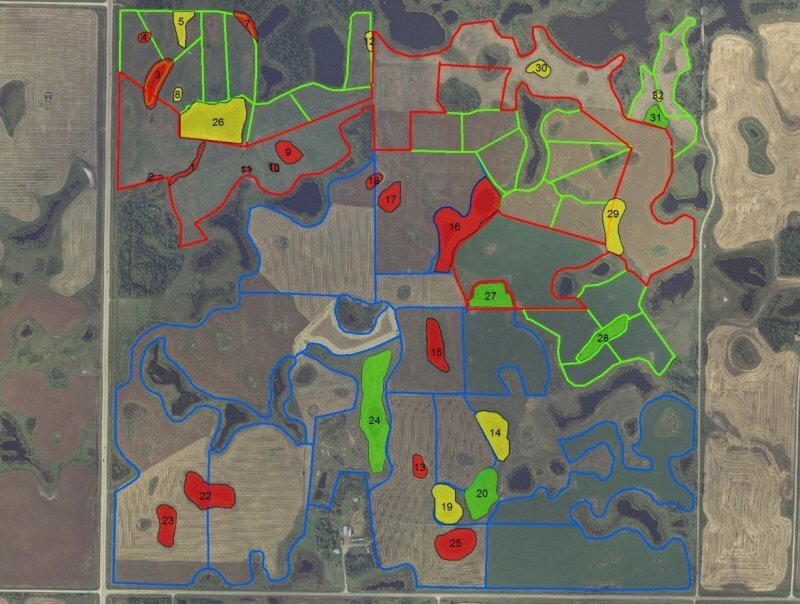 The results are useful for setting management priorities and determining if any action or further monitoring of the wetland health is required. To collect baseline health assessments to determine the overall condition of the 200 riparian areas at the Brookdale site; beginning in 2015 and repeated over 3 years. To make specific land management recommendations that will improve or maintain the riparian areas. As of October 2016 - Only six riparian assessments were completed in summer 2016. This is less than expected and was due to rainy weather conditions and other factors. All six assessments were completed in the NE quarter of Brookdale Farm. Half of the areas assessed ranked “healthy” (27, 28 & 31 in the diagram included in the picture gallery). All of these areas are currently fenced off which includes a large part of the reach, therefore impacts from cattle have been minimzed. They also all have woody vegetation of different age and size classes present. The remaining three areas (29, 30 & 32 in the diagram included in the picture gallery) all were assessed as “healthy but with problems”. Heavy browsing of woody vegetation was present as well as areas with severe impacts by grazing cattle (pugs & hummocks). Some management changes may be necessary for those riparian areas. The plan is to increase the number of riparian area assessments in the next season. As of September 2015 - Twenty-four of the over 200 wetlands at the Brookdale site were assessed during the summer of 2015 to determine their overall condition. The results of the 2015 assessments indicated that sixteen of the wetlands were unhealthy, six were healthy but with problems and two of the wetlands were healthy. Over the next two years, assessments will continue on the remaining riparian areas. Also, riparian areas already assessed will be reassessed on an ongoing basis every one to two years to determine changes in impacts from land management practice changes.